Drumstick and Mango combination is the best for sambhar. The combination proved again in this coconut based simple curry. This is Muringakka Pacha Manga Curry from God’s own country Kerala. 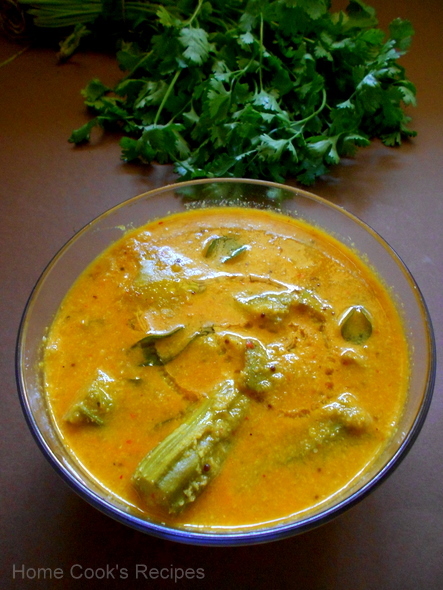 A finger licking curry, with simple recipe is so rare, this curry is one among. you can make this curry in minutes if you have small onions and grated coconut ready in hand. Cut the Drumstick and Mango into pieces. Cook both the vegetables in one cup of water. Or Microwave the vegetables in microwave high for about 10 minutes. Heat one tp of oil in a pan, add small onions and fry till they are cooked. Add grated coconut and dry red chilli’s and saute it along with onions for a minute in slow flame. After that remove from flame. Let it cool and grind it into fine paste with ¼ cup of water. In a Pan, mix both the boiled vegetables and the grounded coconut paste and mix. Add salt to taste, a pinch of turmeric powder to the pan and mix. Let the curry boil for about 2 – 3 minutes in medium flame. In a Small tadka pan, heat a tsp of coconut oil, add mustard, cumin and curry leaves. Once the mustard splutters, remove the pan from flame, add the tadka to the pan in which curry is boiling. Serve Hot with Rice or Idly. 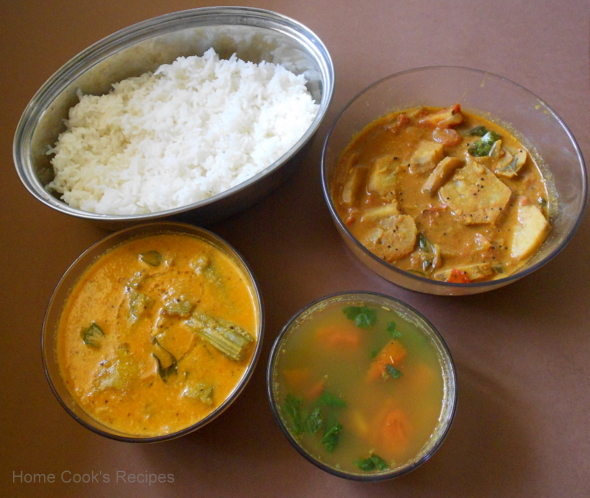 Weekend Lunch with Pacha Manga Curry, Vazhakkai Kuzhambu and Rasam with Herbs. Just before serving , warm a tsp of coconut oil and add it over the curry for a nice aroma. The taste of this curry is all based on the Raw Mango, so pick the raw mango carefully. Wow this looks really delicious. Love raw mango .. looks yummy. Mango Curry looks to be very delicious and comforting. Excellent preparation. Nice to see this dish... Its an appetizing dish..
Just looking to that pic i am drooling and the last pic, well i wish i was in your place right now. Super delicious curry, makes me hungry.. This combination is new.Looks yummy! I am drooling here and the recipe and pictures look so tempting. I love the ingredients and seasonings in this recipe! YUM! first time to ur beautiful blog....following uuuu.